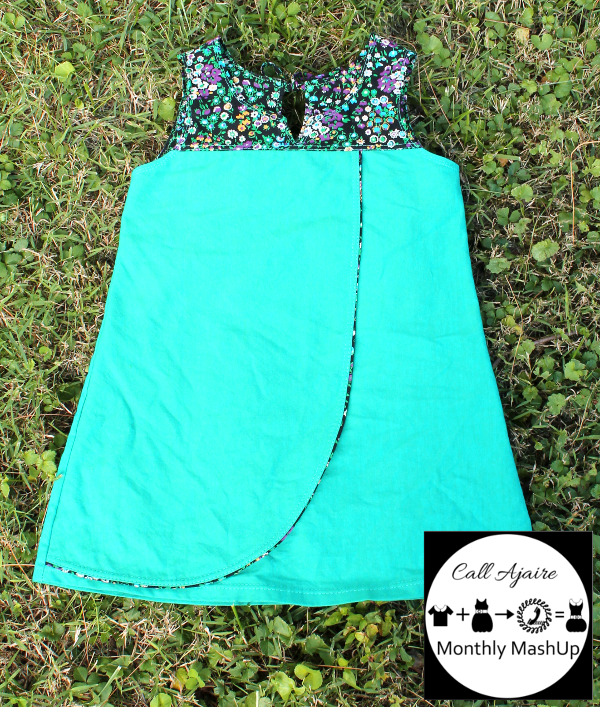 Now that the patterns pieces have been altered we can finally sew the Monthly MashUp (MMUp)! Today in the mash-a-long we’ll go over the sewing steps that aren’t specifically in one of the two patterns. I will refer to steps that ARE in the pattern tutorials out of respect for the designers. If you weren’t the winner of the giveaway, then you can still purchase the Tobago Tank from Sis Boom and the Estherlyn’s Jumper from The Merry Church Mouse. There aren’t a lot of extra steps in this MMUp. Most of the pattern comes together by piecing according to the tutorials, but there are a few trip up areas where I can give you some guidance. Start by following the Estherlyn’s Jumper Tutorial Step 1 through Step 7 to add trim if desired and to prepare the apron. Skip Step 2 since we aren’t adding buttons and keep in mind that we used the 3/8″ seam allowance for the Apron and skirt when we made our alterations so follow the tutorial seam allowances as well. I also like to press up the hem before the front and back skirt are sewn together to give the fabric a memory that will make pressing the full hem easier in the final step. 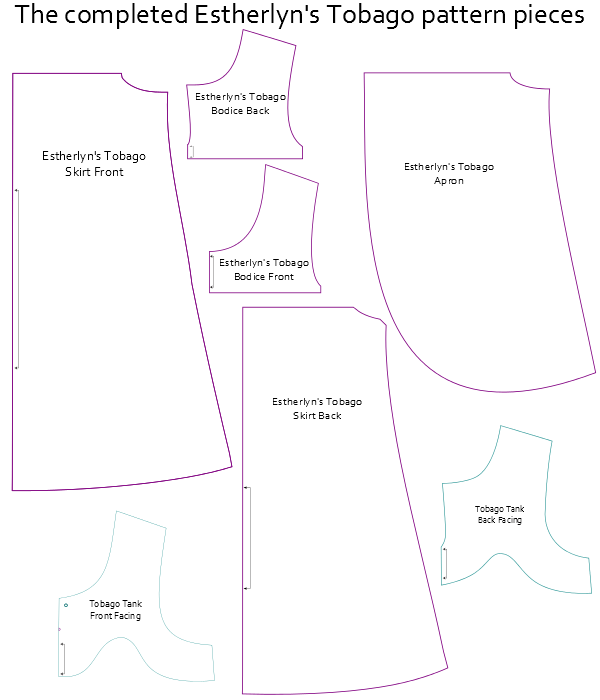 Using the altered Estherlyn’s Tobago Bodice Front and Bodice Back, attach the bodice to the Skirt Front (with Apron) and the Skirt Back, respectively. 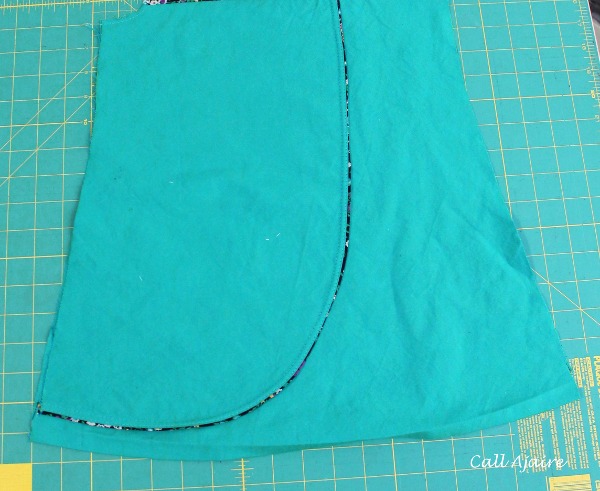 Follow the Estherlyn’s Jumper Tutorial Steps 8 through 11) ignoring the parts about a lining. Prepare the Tobago Front Facing and Back Facing as described in the Tobago Tank Tutorial. I serged mine as you can see in the picture above. 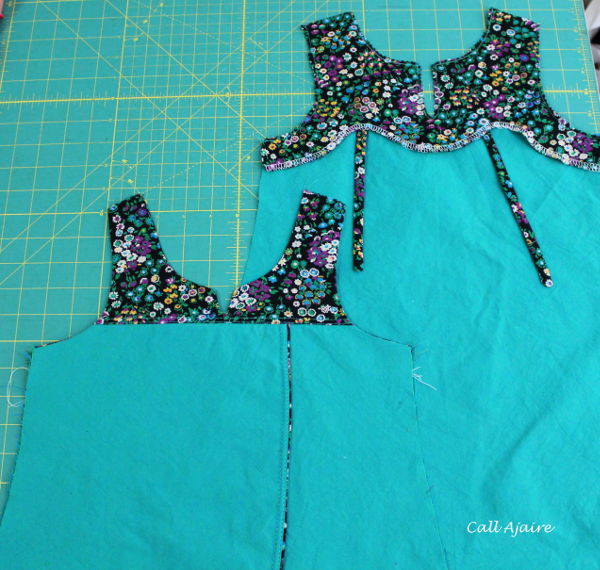 Then, treating the Estherlyn’s Tobago Front Bodice and attached Skirt as if it were just a bodice, follow the Tobago Tank Tutorial for sewing the neckline and armhole edges. Remember that we used the Tobago Tank 1/4″ seam allowance for these altered seams so follow the pattern tutorial instructions for the SA. 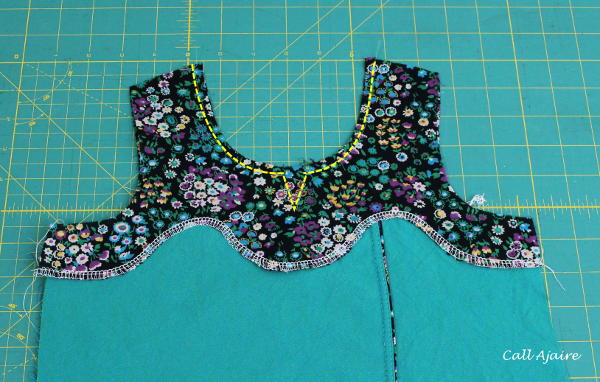 Take care at the point of the v notch because it will run very close to the top stitching along the bodice/skirt seam. In the above picture you can see where I’ve pulled up the facing to show just how close the point is to the seam. The back neckline cut out in the smaller sizes will be this close to the seam as well. It’s not an issue, just keep an eye on it. If you don’t want the v notch, then follow the un-notched front option also in the tutorial. 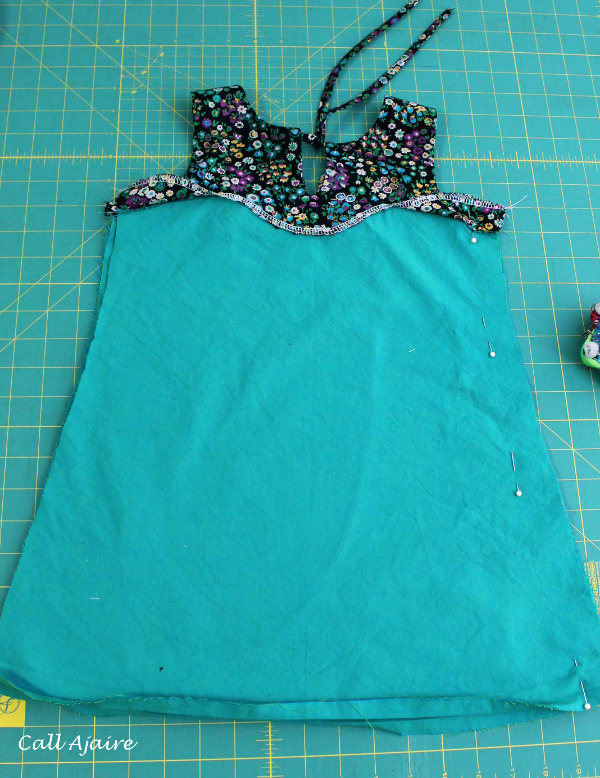 Follow the Tobago Tank Tutorial for the Back Facing/Back Bodice as well. At this point we have the Front and Front Facing with the right sides facing OUT and the Back and Back Facing with the right sides still facing IN. 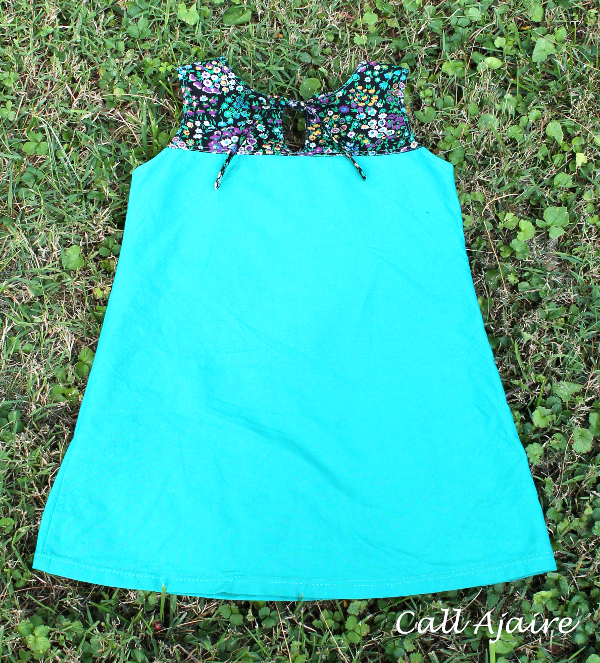 Follow the Tobago Tank Tutorial for attaching the shoulders. 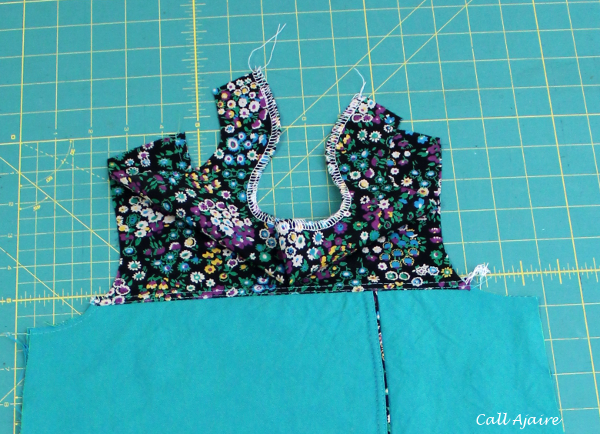 Flip up the facings and sew the side seams together by following the Tobago Tank Tutorial except for this seam use the 3/8″ seam allowance instead of the 1/4″. Gorgeous!!! Goodness I love it! The fabric choices are so fun. I love it!